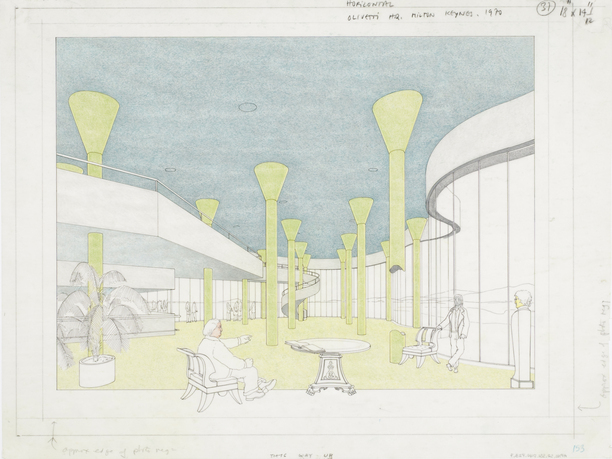 James Stirling (Firm), British Olivetti Headquarters, Milton Keynes, England: interior perspective, 1970-74, ink, colored pencil and graphite on paper, 41.6 x 55.1 cm. 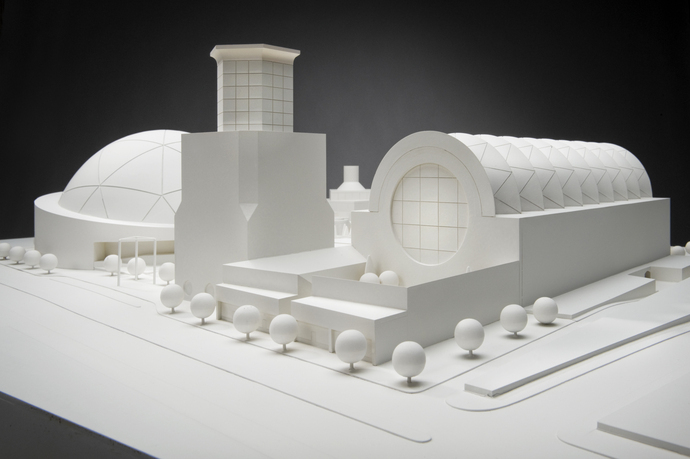 The Yale Center for British Art and the Canadian Centre for Architecture co-organize the first international exhibition of the archive of James Stirling—British architect, Yale School of Architecture professor, and Pritzker Prize laureate. Stirling (1924–1992), regarded as one of the most important and innovative architects of the twentieth century, earned international acclaim through bold and innovative projects such as the Leicester University Engineering building (1959–63); the History Faculty building at Cambridge University (1964–67); the Neue Staatsgalerie, Stuttgart (1977–84); the Clore Gallery for the Turner Collection at Tate Britain (1984); and the Arthur M. Sackler Museum at Harvard University (1979–84). 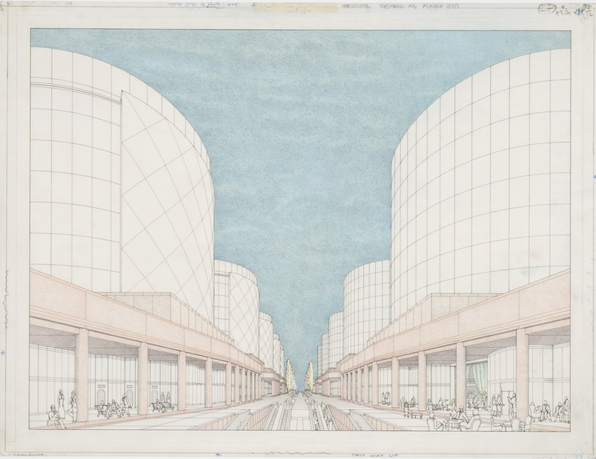 Notes from the Archive features more than three hundred original architectural drawings, models, and photographs drawn from the James Stirling/Michael Wilford fonds at the Canadian Centre for Architecture. Together the works reveal Stirling’s wide-ranging approach to architectural composition and language, as well as the fundamental importance of historical and modernist architecture to his work. 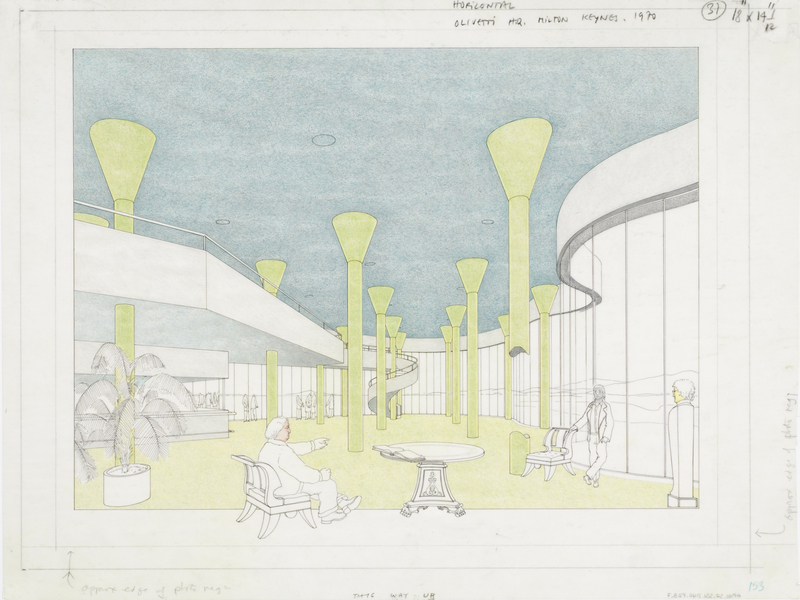 A concurrent exhibition at the Yale School of Architecture includes nearly three hundred drawings by seventy students who studied architecture under Stirling’s tutelage. 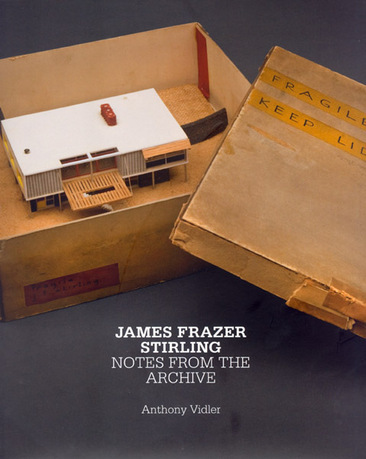 Notes from the Archive: James Frazer Stirling, Architect and Teacher premiered at the Yale Center for British Art in October 2010. The exhibition travels to Tate Britain, London (spring/summer 2011); Staatsgalerie, Stuttgart (fall 2011); and the Canadian Centre for Architecture (spring 2012). Presented to the university by Paul Mellon (Yale Class of 1929), the Yale Center for British Art houses the largest and most comprehensive collection of British art outside the United Kingdom. The Center's collections, exhibitions, and programs explore British art, life, and culture from the fifteenth century to the present. As both a public museum and research institute, the Center is an international leader in scholarship, research, and education, offering a year-round schedule of exhibitions and educational programs. Through intelligent and thoughtful displays of the permanent collection and temporary exhibitions, the Center seeks to reach a diverse community and provide access to the mix of pleasure and instruction that is unique to works of art. The principal vehicle for scholarship and interpretation at the Center is an active exhibition program, which includes four-to-five major exhibitions and a number of smaller in-house shows presented annually. The Canadian Centre for Architecture is an international research centre and museum founded on the conviction that architecture is a public concern. Based on its extensive collections, the CCA is a leading voice in advancing knowledge, promoting public understanding, and widening thought and debate on architecture, its history, theory, practice and role in society today.